The fading reputation of the Oakland-Alameda County Coliseum has damaged its ability to survive, let alone compete with newer Bay Area facilities. Here's how the sports complex's image, and perhaps its future, can be salvaged. The nearly 52-year-old Oakland-Alameda County Coliseum complex has been the home of countless great, unforgettable moments in sports and music. So why does everyone badmouth it? Even as it enters AARP status and heads for its inevitable demise, the aging stadium-arena complex should be viewed as a storied Mecca for American pop culture. Instead, it's treated as if it's Rodney Dangerfield with a dirt infield. No respect. Not since the final days of blustery, crumbling Candlestick Park has the Bay Area had such a maligned facility. It doesn't have to be this way, of course. Those who run the Coliseum can change the conversation, reminding Bay Area sports fans of the rich history and appealing future of a stadium site that former Raiders executive Amy Trask has dubbed "the best in the NFL." The Oakland-Alameda County Coliseum Authority is composed of a revolving roster of two Oakland City Council members, two Alameda County supervisors, and four appointed non-politicians. The Coliseum Authority, along with a small staff that includes an executive director, have managed the stadium and arena since 1995. But the times are-a-changin' at 66th Avenue and Hegenberger Road. Two Oakland sports teams - the Raiders and Warriors - say they'll be gone by at least 2020. And the Athletics, who've repeatedly stated their preference to be closer to downtown, hope to be in a new Oakland ballpark by 2023. So, it's likely that the Oakland Coliseum, currently one of the nation's busiest sports-and-entertainment facilities, will lose all three of its sports tenants within the next five years, perhaps sooner. When discussing that possibility in recent months, Coliseum Authority members' emotions have ranged from palpable frustration to expressing hope they can land new sports tenants, such as a NFL expansion franchise or a pro soccer squad. For that to happen, however, those who run the Coliseum need to change the conversation about the East Oakland property, transforming its negative image into a positive one. This can be accomplished in a number of ways, such as making small but important physical improvements to the Coliseum, fostering a greater sense of community ownership around the complex, and doing more to better celebrate the Coliseum's rich history. Most of the following ideas could involve - and might even require - partnering with corporate sponsors, labor unions, and/or nonprofit organizations in order to save public money and protect taxpayers. The good news? The Bay Area is teeming with such entities. To the credit of A's President Dave Kaval, Oakland's baseball team has already made improvements to its home game experience by adding food trucks outside the stadium, removing tarps from the third deck, and installing a charging station for electric vehicles. The Coliseum Authority, also known as the Joint Powers Authority (JPA), can follow Kaval's lead and beautify the proud old yard by placing green ivy over the stark Brutalist concrete that BART commuters pass by every day. Another way to clean up the Coliseum's image is to make it a greener, cleaner place. This can be done by adding solar panels among its sea of parking, soaking up all that East Bay sunshine to lower the complex's energy bill and reduce its carbon footprint. Also, the Authority can work with environmental groups to clean up Damon Slough, the marshy water that runs between the Coliseum and the BART station. * Nelson Mandela's 1990 appearance at a sold-out Coliseum, the statesman's lone Bay Area visit. * Oakland A's highlights such as the 1972-74 World Series dynasty, the 20-game win streak in 2002, the 1989 World Series victory, and the American League Western Division clincher in 2012. * Oakland Raiders moments like the Heidi Bowl of 1968, the thrilling Sea of Hands playoff win in 1974, and the 1976 and 2002 AFC Championship victories. * Golden State Warriors memories such as Sleepy Floyd's 51-point playoff performance in 1986, the 2007 "We Believe" team, and the Steph Curry-led champs of 2015 and 2017. * Day on the Green concerts from the early 1970s to the early 1990s, including Led Zeppelin's last North American performance - in 1979. Also, the Coliseum Authority staff can work with local TV affiliates to produce an hour-long documentary, celebrating and promoting the Coliseum's legacy. Cable channels always need content, and video vignettes of Coliseum history would be perfect for YouTube viewing. * Costs tied to the city's chronic health issues, such as helping West Oakland asthma patients, removing lead from Fruitvale district land, and helping to remediate any other ecological problems throughout the city. * Promoting environmental programs in Oakland, as well as green-tech and clean-tech job companies and job programs. * Renovating or improving East Bay parks and nature trails. Partner with the Oakland Unified School District or the Oakland School of the Arts to hold art contests, asking students to create paintings, sculptures, or videos depicting their favorite moment at the Coliseum. A revolving set of winners could have their art work exhibited in the Coliseum's Westside or Eastside clubs each month. It's no wonder so many residents feel alienated by the East Bay sports franchises. Locals have paid taxes for years to fund Coliseum and Oracle Arena renovations, but they're rarely included in the facilities' activities unless they pay top prices for a game or concert ticket. * Partner with Easy Bay tech firms and tech-related nonprofit groups to hold hack-a-thons in the Coliseum, followed by a game or concert. * Work with the area's bicycle and transit advocates to make the Coliseum more bicycle-and-pedestrian-friendly. * Invite faith-based communities to hold events at the Coliseum before and after games. Authority members could also take a page from the A's by encouraging local fans to share their ideas on how to improve the Coliseum. As Kaval's A's-related office hours have shown, most East Bay sports fans are willing to share their creativity. And as is the case with me and this column, Oakland fans don't want money or credit in return for their ideas. They just want their city and favorite teams to put their best foot forward, so this community again can bask in the pride that their home teams - along with their stadium and arena - are supposed to provide a region. It will take a little sweat and innovation. 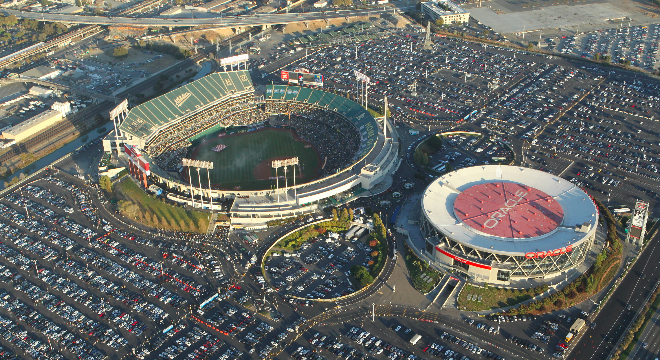 But if East Bay leaders truly want the Coliseum complex to remain a viable site for sports and entertainment, public perception must be shifted in their favor. Implementing even a few these ideas could be the first crucial steps toward reaching that goal.